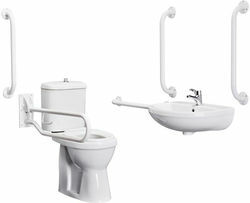 Premier DocM > Complete DocM Pack With Toilet, Basin, Tap & White Rails. Complete DocM pack with white rails. Comfort height toilet pan and cistern. 5 x Grab rails in white (5th grab rail to be fitted to back of door). Mirror and bottle trap is not included. 5 Year guarantee: Premier guarantee this DocM pack for 5 years. 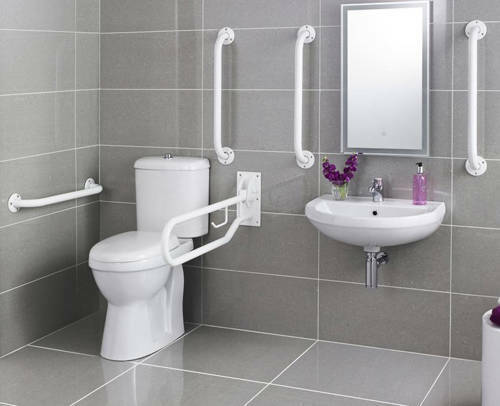 Premier DocM range of ceramics come complete in one box, are British building regulations standard and ideal for commercial installations, pubs, clubs or just the home.